All animals, including dogs, have a special sensitive period at the start of their lives. During this time, they learn to accept things around them so that they are not afraid of them later in life. In puppies, this window of opportunity closes at about 12-16 weeks of age. Anything that is encountered during this time will be tolerated, even enjoyed. After the window closes, unfamiliar people, objects and experiences are approached with caution and may become fearful, which could ultimately lead to aggression. Puppy socialisation involves meeting and having pleasant encounters with many adults, children, dogs (puppies and adults), particularly during this sensitive period of their lives and then continuing until adulthood. During this process, they will also need to get used to a wide range of events, environments and situations. The most common cause of fear and aggression is lack of socialisation. A puppy does not have to be miss-treated to become afraid of people or new experiences. To be a successful pet, dogs need to get on well with other living creatures as well as coping with a variety of different everyday experiences. Puppies that are well socialised grow up to be friendly and happy with people and animals, taking different situations in their stride and enjoying going anywhere with their owners. Sadly, not all puppies are so lucky. A puppy that has not received adequate socialisation may bite the postman or a child, may be aggressive to other dogs or very afraid of strangers. It may be very frightened when taken to new places, or to the vet, or be sick through fear when riding in the car. A natural response of a fearful dog, if it has no means of escape, is aggression. As well as aggression, many other behaviour problems have their origins in fear. This fear is often due to lack of adequate experience during puppy-hood. The resulting behaviour problems are often difficult for owners to cope with and may result in the dog being relinquished to an animal shelter where it will face a very uncertain future or, if the behaviour is extreme, in euthanasia. More young dogs are killed because of behavioural problems than die from diseases we vaccinate against. Good socialisation and habituation can help prevent many problems. The time to start is NOW! Socialisation is easy – it just has to be done! Puppies need to experience as many encounters as possible during their first year of life, particularly during the sensitive period, without being overwhelmed with too much. Ideally, socialisation should start with the breeder. If you own puppy that was reared in a quiet house or, worse, outside in a kennel or barn, you will have to work hard as soon as possible to make up for lost time. With any puppy, the time to start is now. Carefully arrange for your puppy to have several new experiences every day, allowing plenty of time for rest and recuperation in between. Take your puppy out and about with you as much as possible, taking care not to overwhelm it with too much and to keep it safe from infectious diseases (see later). As your puppy gets older, it will be able to cope with longer encounters and more of them. Make sure all encounters are enjoyable for your puppy. Give strangers tasty treats to feed your puppy and a favourite toy so they can play. If your puppy seems anxious or overwhelmed, give it more space and freedom to approach in its own time. Think ahead and try to prevent unpleasant events. Arrange for all encounters to be successful and rewarding. Remember young puppies tire easily so keep encounters short and sweet. Humans – adults and children Puppies need to have pleasant encounters with different types of people and different ages of children every day. Ensure your puppy has happy encounters with veterinary surgery staff and delivery people also. 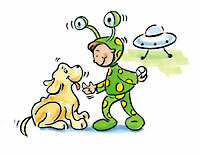 The more humans your puppy meets and plays with, the more tolerant and friendly it will become. Other dogs and puppies Puppies need to play with other dogs and puppies. Prevent your puppy from feeling overwhelmed by squatting down to create a safe haven to return to if he is worried. Allow him to mix with sociable dogs only. Interrupt any behaviour you do not want your puppy to show to other dogs as an adult. 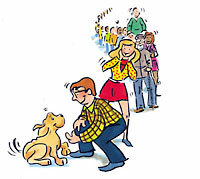 Join a good puppy class (see later) where he can learn to mix with others of different breeds and temperament. Different experiences/environments Take your puppy to places where he can experience car travel, traffic, crowds, towns and countryside. Imagine how it feels to be small and vulnerable and ensure your puppy is enjoying the experience. Cats, livestock, horses Puppies should meet a variety of other animals. Keep your puppy on a lead to prevent it from learning to chase or harass other animals. Young animals are very susceptible to disease before their immune systems have had a chance to become effective. Very young puppies acquire some immunity from their mothers which protects them during the early weeks. This fades over time and needs to be replaced by immunity stimulated by vaccinations. Some vaccines allow the vaccination course to begin at the age of six weeks allowing earlier socialisation than was once possible. Since keeping a puppy isolated until it has developed full immunity can ruin it's future character, a compromise must be reached between the need to protect against disease, and the need to ensure good mental health. As most of the socialisation will be with humans rather than other dogs, such a compromise is feasible and, if the following guidelines are adhered to, it is possible to socialise your puppy and avoid the risk of infection. Take on a puppy and you take on the responsibility for its future. This can be daunting, but there are lots of good sources of further information to help you do a good job. Ask your vet if they run puppy parties. These will help you to begin the socialisation process in a safe environment and allow your puppy to meet others while it is still very young.